If you have been listening to the words coming out of Ben Carson’s mouth, it is clear to you that one of the leading Republican candidates is dangerously uncomfortable with matters of foreign policy. It is also abundantly clear to his own advisors. “Nobody has been able to sit down with him and have him get one iota of intelligent information about the Middle East,” said Duane R. Clarridge, Carson’s top advisor for terrorism and national security said in an interview with New York Times reporter and likely wizard Trip Gabriel. Clarridge also said that Carson necessitated weekly briefing calls so his advisors “can make him smart,” and that an intelligence operative had even briefed Carson incorrectly this week. “You know how it goes when people are desperate for some headline,” Clarridge said. Carson’s campaign responded by calling Clarridge old. “Mr. 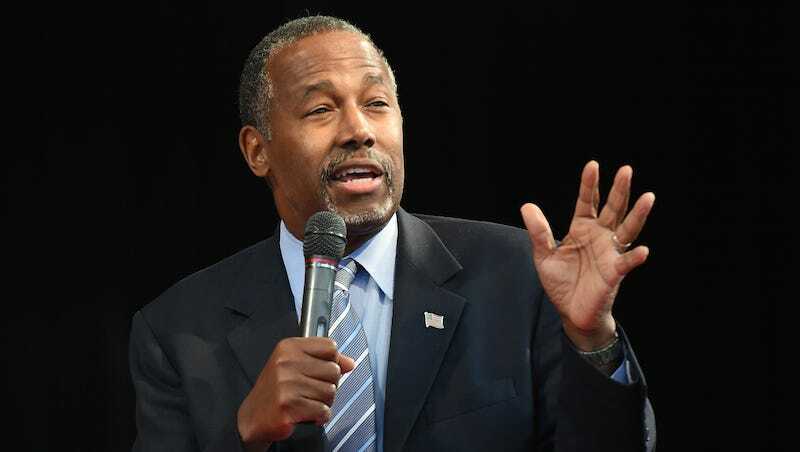 Clarridge has incomplete knowledge of the daily, not weekly briefings, that Dr. Carson receives on important national security matters from former military and State Department officials,” said Doug Watts, a spokesperson for Carson’s campaign, in an email to Business Insider. New York Magazine notes that the response implies that Carson was receiving intel from someone the campaign felt was too old to be trusted, which is also not great for their look. Nor is alienating old people, the sturdy base of the Republican party.